Does the BlueLine blue light inspection system meet code? If you do a visible light inspection with dual use particles you can use the blue light and glasses to enhance the contrast, and thus the sensitivity, of that inspection. This conforms to ASTM E709. • The technique is demonstrated to the satisfaction of the attending ABS Surveyor on ABS Classed ships and other vessels." BlueLine NDT can provide the equipment and guidance needed to meet these requirements. If your inspection requirements call for ultraviolet light under dark conditions (less than 2 fc), governed by a document such as ASTM E1417, E1444 or similar, then the substitution of the blue light inspection system is NOT yet acceptable. While we can demonstrate the technical and performance equivalence of our blue light system (see the pages on performance with particles and penetrants), it takes time to get this into the code. BlueLine NDT is working with the standards agencies to address the technical issues and provide the data needed to incorporate the blue light inspection system into code documents. As described on the Applications page, many companies are using BlueLine's blue light fluorescence technology to increase productivity in ways that are not governed by standards. It's often not even a question of replacing ultraviolet light, but of using fluorescence where it would not have been used before. • Put the FL5000 in the hands of your rework personnel - this is a popular use, and definitely saves time. Instead of just working on the circle that the inspector draws around the indication, the shop team can easily see the indication and know exactly what they are being asked to rework. "The FL 5000 light we purchased is working above our expectation. It is cutting our rework time in half." 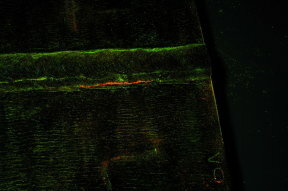 • You can use the FPS-1 Fluorescence Photography System for documentation of your findings. This is an informational/reporting application. You are not using the camera system to do the inspection, just to record the results. • If you set your own in-house controls and standards, it may well be worth your while to evaluate the blue light system, either as an alternative to ultraviolet that you are using now, or as a totally new approach. • If you have third-party inspectors coming into your facility to do the formal inspections you can do your own pre-inspections and catch issues in advance, saving time in the long run. As we learn of any new ways that the blue light inspection system is being used we will post them on the Applications page.